Keno is an import from China and is played both online and in live casinos. The object to the game is to pick numbers that will match the twenty drawn for each game. There are 80 numbers total so it is not an easy task to pick eight to ten numbers that match. The payoff if you do pick the correct numbers is substantial depending on what you bet on the ticket. In a live casino the game can pay as much as $25,000 for a one dollar bet. Online casinos set their own payoffs and it would be wise to look it up for each site you are interested in playing on. A player can play a straight eight spot ticker or several combinations on the same ticket. You could for example pick eight numbers and four sets of two numbers. The point is the game is not one of skill, but one of hunches and pure luck. Some players do keep track of hot numbers and make sure they include them every ticket. Others just use the pick and pray technique for playing a ticket. Some other popular plays are the four corners, eight single spots and play a row on a ticket. People have won playing birthdays and anniversary dates. If you are lucky you win and otherwise it is on to the next game. 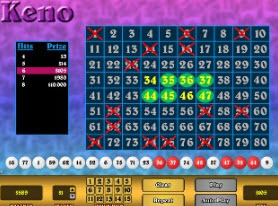 Many players will play a keno ticket while having dinner or breakfast in a casino. They just figure it as part of the cost of the meal. Poker rooms in casinos often have runners and players at the table will play the same ticket for hours on end while they are playing poker. It is true for players pulling handles or pushing buttons on the slots. Both sets of players hope they catch lightening in a bottle with a winning ticket. Many casinos will let you buy the next ten games so you do not miss a game. There is nothing worse than watching your numbers come up without a bet on the game. Many casino patrons play keno while taking a break from the table games or while sitting at the bar and having a drink. They will buy a set of tickers before going to eat or when going to a show in the casino. The feeling is the player wants to stay in action even when doing something else. Keno is popular and also one of the worse bets you can make in a casino due to the house edge. It is popular because it is so easy to play and if lucky win a good sum of money. The simplicity of marking a ticket and making the bet means that the player has to learn nothing in order to play the game. This game is one of the best moneymakers for the casino that they offer to the public.